I was able to identify almost all of the pedals, but there are a couple in question. If you can help fill in the blanks, please help by commenting on this post! ?? Distortion – in the show, they were working on a nasty distortion. I would suspect that the grey pedal is a home made type of dirt box. 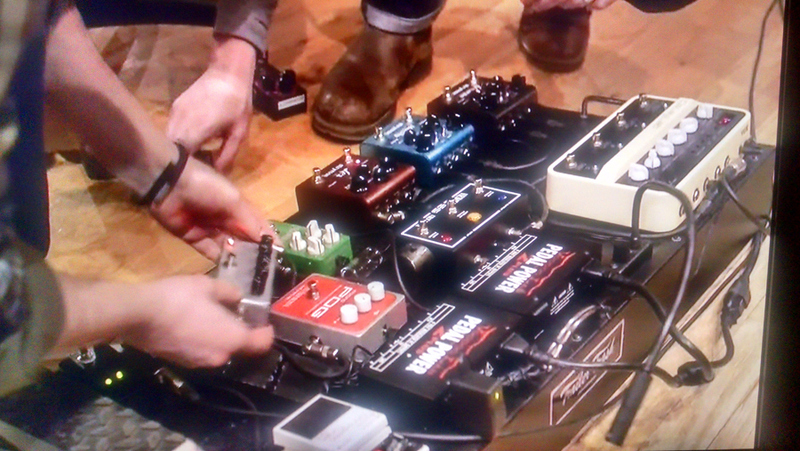 In previous pedal board shots, he would have a Fulltone Fulldrive 2 here. Again, if you can provide some light on the Black 3 button pedal (UPDATE 10/27— this has been identified as the Heptode Virtuoso Phase Shifter that looks modified), please let us know by commenting below! Also, did you catch Sonic Highways? Let’s us know what you think about the series! The 3 button pedal is a Heptode Virtuoso Phase Shifter. Its a clone of the old Maestro Phaser. Looks like it must have been modded to add that expression wheel on the side? Way cool. I’m going to guess a Zvex Fuzz Factory clone for the mystery distortion mentioned above. After watching the episode and noting it had five knobs in a 1590B enclosure oriented horizontally, I’d feel that guess is pretty safe. That isn’t a knob on the side of the Heptode Virtuoso Phase Shifter. It’s an Ebow just sandwiched next to the pedals.